But my understanding, which is not totally naieve, is that there are many mechanisms of disruption. I am not going to use any research to answer your question here, and I am not one for details, but here goes, my attempt to pursued you, via answering it. The first thing that you need to understand is that of all the millions or billions of variables that constitute our bodies: Oxygen, Water, salts, amino-acids… there is only one that is totally biologically ubiquitous. This is electricity: Within, and between, every living are electrochemical processes that operate on tiny, tiny voltages. 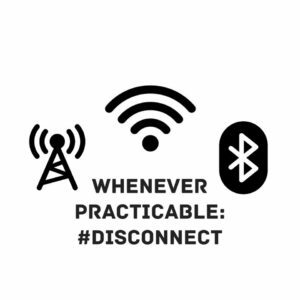 The second thing that you need to understand is that wirelessly connected devices gain their connection via electromagnetic energy. The third thing you need to understand is that connected devices operate at energy levels thousands and thousands of times higher than, both the natural background EMF energy (As the earth was 200 years ago, or so) and the biological levels found in every living cell in our bodies. You need to understand and accept these three things before proceeding really Alexs. They are just science fact, which you should be able to easily disprove or accept. Once you agree with the three understandings above then you can start to extrapolate from those premises. Does it seem plausible that connected devices could cause biological change? I think it does, why would it not. There is nothing special about the electrical energies involved here, over and above say, an electrical motor. Would such changes be unnatural? I think clearly yes. Three hundred years ago no human had expected anything like the levels of even measly Bluetooth4. (This is one point I am not convinced about without further researching. #cosmicblasts etc). Would such changes be disruptive? I would imagine that if you were to be able to take a person with a magic wand just randomly change the nano-voltages in the electrical systems in their bodies then those changes would have a point at which they would become noticeably negative. This seems totally reasonable to me as an assumption. And it is a case analogous to EMF, except with EMF it is more point of source dependent. So where we are now, I think, without any science evidence, just thinking, is an understanding that, because of the nature of connected devices and biological systems, it is plausible that there could be negative effects from connected devices. The next stage in my answering your question is to look at evidence. Is there evidence that supports the above plausible hypothesis? I think there is lots. This entry was posted in Wellbeing on March 1, 2018 by mat.